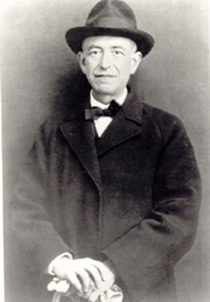 Born in 1876 in Cadiz, the historical seaport town at the southern-most tip of Andalucia, Manuel de Falla is the greatest Spanish composer of this century. His formal musical education began with piano lessons, and when Falla was twenty his family moved to Madrid where he studied with the distinguished teacher José Tragó. He then went on to study composition with Felipe Pedrell, the teacher and scholar who led the revival of Spanish music which took place towards the end of the nineteenth century. In 1904 Falla's one-act opera La vida breve (Life is Short) won the composition competition of the Real Academia de Bellas Artes and at the same time he was awarded a prestigious piano prize organised by the piano makers Ortiz y Cussó. In 1907 he achieved a long-held ambition of travelling to Paris and was welcomed there by Ravel, Debussy (with whom he had previously corresponded) and especially by Paul Dukas. He completed several chamber works and began work on Noches en los jardines de Espãna (Nights in Gardens of Spain )before the outbreak of war in 1914 compelled him to return to his native country. Two years later he was approached by Diaghilev to write a work for the Russian Ballet and in response composed a mime-play in two tableaux, El corregidor y la molinera (The Magistrate and the Miller's Wife) which, with some subsequent revisions, became El sombrero de tres picos (The Three-Cornered Hat), and was produced highly successfully in London in 1919 with choreography by Massine and designs by Picasso. Following the deaths of his parents in 1919 he settled in Granada, where he remained until the end of the Civil War (1939), and composed several of his most important works including El retablo de maese Pedro (Master Peter's Puppet Show), Psyché and Concerto per clavicembalo (Harpsichord Concerto). He then moved to Argentina and worked there until his death in 1946 just a few days before his 70th birthday, leaving the vast oratorio Atlántida still unfinished.